As you may know, Cushing's can cause insomnia, or a change in your diurnal rhythm. 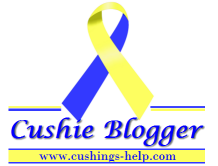 People with Cushing's often can't get to sleep at night but could sleep all day long if you let them! I had months at a time where I was out of work and only slept between 7am-3pm. Now, even though I don't have Cushing's anymore, I am still a night owl. I rarely stay awake until 7am, but I can usually fall asleep around 1am and get up for work at 8 or 8:30. Often, my best thinking is done when the house is quiet and I'm up all alone burning the midnight oil. Don't get me wrong, I LOVE my sleep, but I like it even better when I can sleep from 2am until noon (sometimes later, I won't lie). Are you a night owl or an early bird? How do you cope with having to stick to a sleep schedule? I for one, cannot NOT sleep in on my days off. I can't force myself to wake up when I don't have somewhere to be. I need to collect those sleep spoons!